I am a huge fan of this author and not just because she’s a fellow Yorkshire rose! Her novels are always full of joyful, real-life women, set in Yorkshire and leave you with that warm and fuzzy feeling, a bit like a roast dinner with good Yorkshire Puddings. I rushed out to buy her latest creation but have only now had the chance to read it, nevertheless I devoured it as quickly as I did her previous reads, mainly because it is just as wonderful as her previous novels. The story centres around three women who meet whilst dress-shopping for their upcoming weddings. Each of the women receives their own ‘section’ of the book which covers their particular wedding although they do all appear all the way through the book. The setting as usual is rural Yorkshire and the characters travel to places such as Leeds and Haworth. 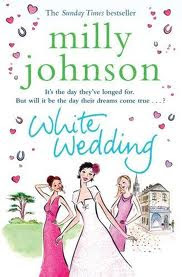 Each of the women has their own trials and tribulations to overcome during the course of the story and not all of these are related to weddings, and they do so in the usual Milly Johnson heart-warming way. They are strong women who know what they want and it is good to see women like this in a novel, if not unusual when it comes to this particular author. For those readers who are planning their own wedding and looking for something which will sympathise with their cause, this book has that too, covering dress shopping, small weddings, big weddings, receptions and honeymoon, so all readers will be able to find something to entertain them. This was a lovely read and I enjoyed myself thoroughly from cover to cover. The book does tie up the stories of each of the main characters and finishes with a lovely Charlotte Bronte quote ‘there is no happiness like that of being loved by you fellow creatures, and feeling that your presence is an addition to their comfort.’ A great sentiment and very relevant to the storyline of this great novel. This one sounds like such a fun book! Sounds adorable! I hope we get this book in the US!